man, thanks everyone for sharing all the nice pictures of her. Man she's so pretty!! !um..mean beautiful. #1 favorite actress....i luv this chick...she is so goregous inside out! why did her and lby break up and when was it? Well according to the press, they said that LBH wanted to settle down and start a family, but SHK wasn't ready because she's still young and want to pursue her acting career. I agree! She looks so cute in everything she wore and some of the outfits were kinda out there, but she made it look good. I actually try to copy her style too. I'm not sure, but are the asian countries ahead in fashion? Because before FH, there weren't a lot of those crop cardigans, but after watching FH, I've noticed that a lot of the korean clothe stores started to have them. Have any one noticed that? Perhaps SHK started the trend! ...or if you want to post it directly from website without resizing it, just right click the pic...go to properties highlight the URL(Address)...right click...copy the highlighted URL...OK...go to the thread you want to post...add reply...image...and paste. My fav k-actress. She's so pretty and talented ^^ Thanks for posting the pics guys! 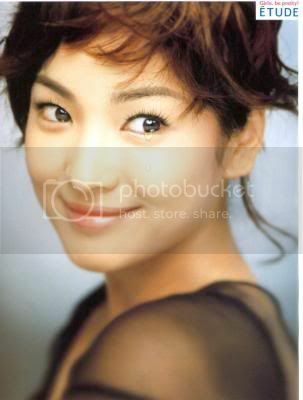 just wanna keep supporting our hye kyo... aja! aja! does anyone have the current olay conference she had? THey broke up last year about May or thereabouts.